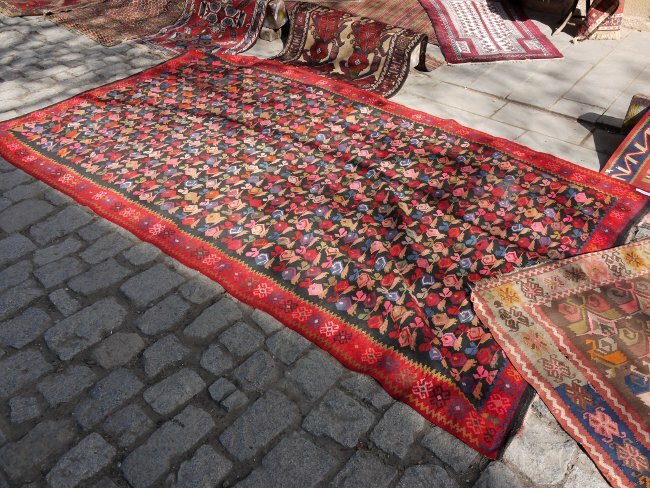 Gone are the days of Persian rug merchants riding into town on camels, pausing below the fortress for a hot sulphury bath before cramming their dark shops with dusty rugs... 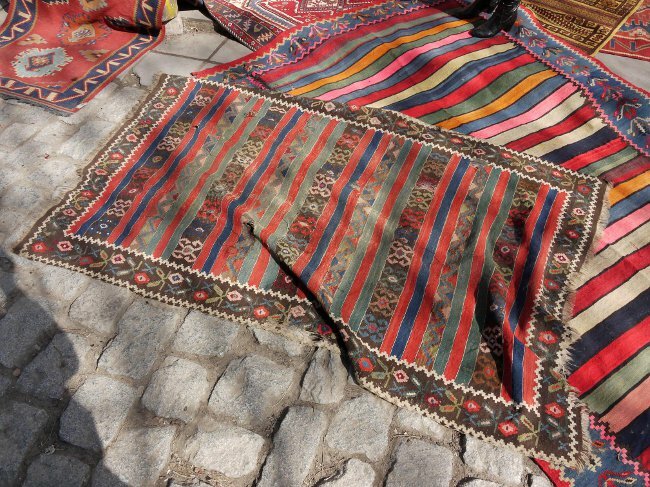 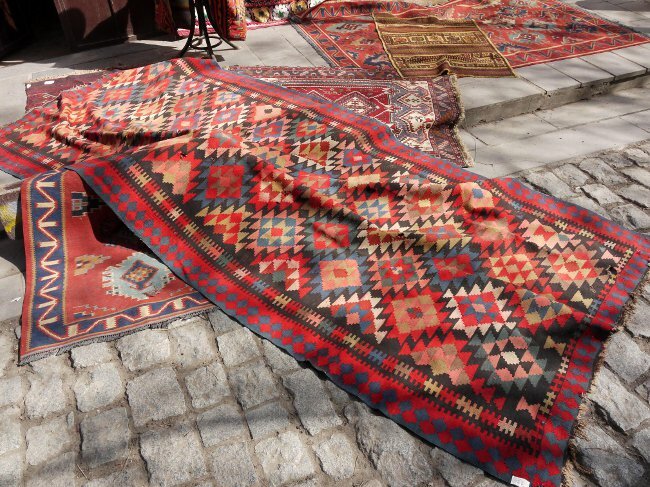 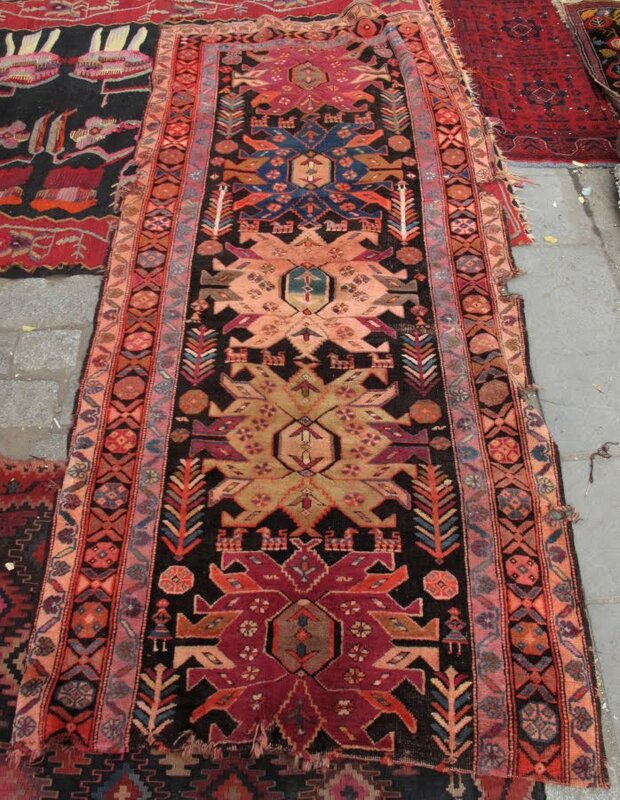 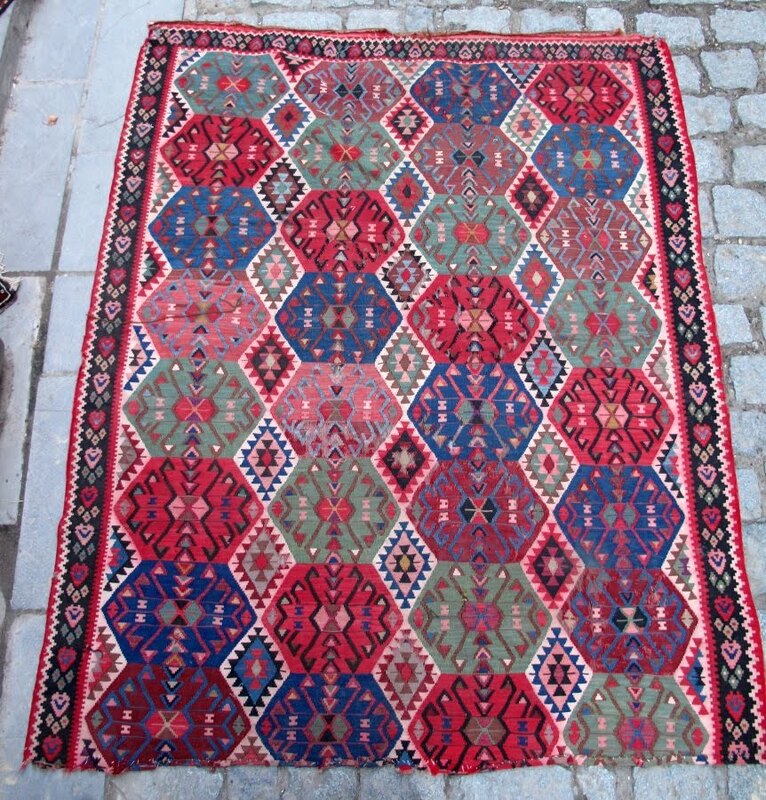 However, Tbilisi is still an excellent place to buy carpets, and although the choice is obviously not comparable to places like Istanbul or Tabriz, the dedicated buyer or collector may find some amazing pieces! 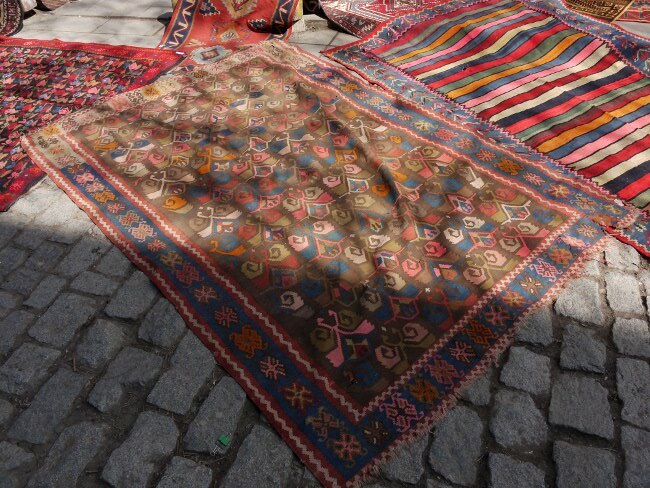 There are about 5 or 6 carpet shops in Tbilisi, and having gone to all of them, I feel justified in recommending the "Caucasian Carpets Gallery" at the end of Erekle II St., just next to the church of Sioni. 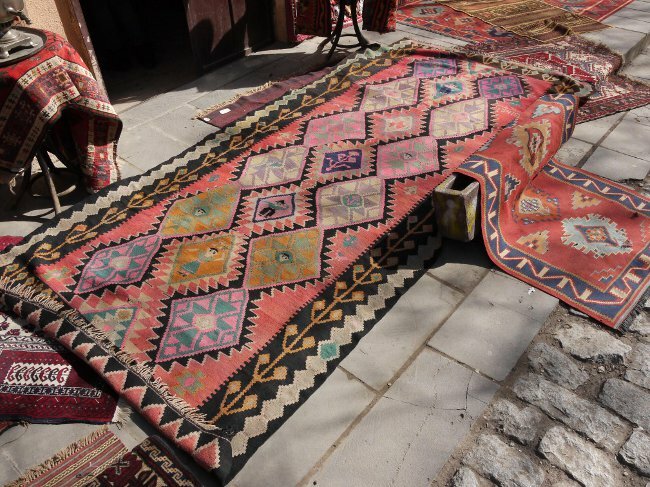 The shop is owned by Manana Arkania, and is run by Patima; both are very friendly and speak good English, and their shop offers the best variety and value for money. 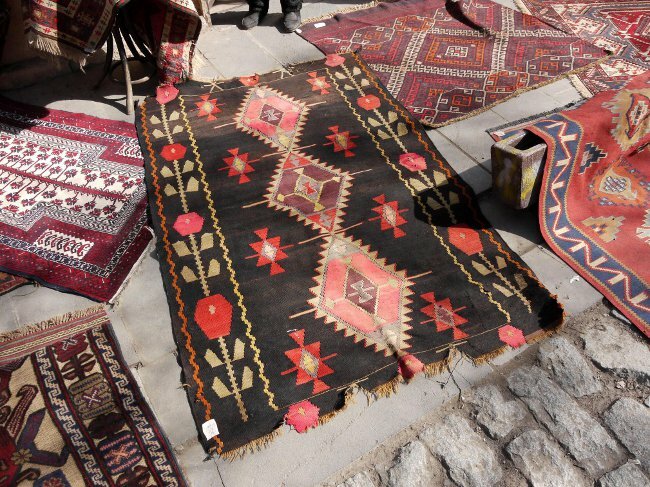 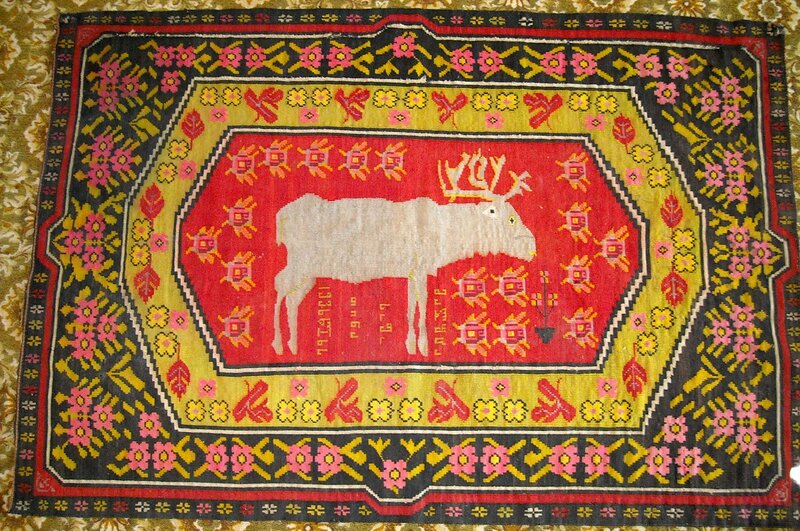 They have carpets and flatweaves (old and new) from all over the wider Caucasus region, and also sell saddlebags, covers, embroideries, cases for cushions, &c. Manana also sells on commission, and she is constantly buying new pieces, so turnover can be quite brisk. 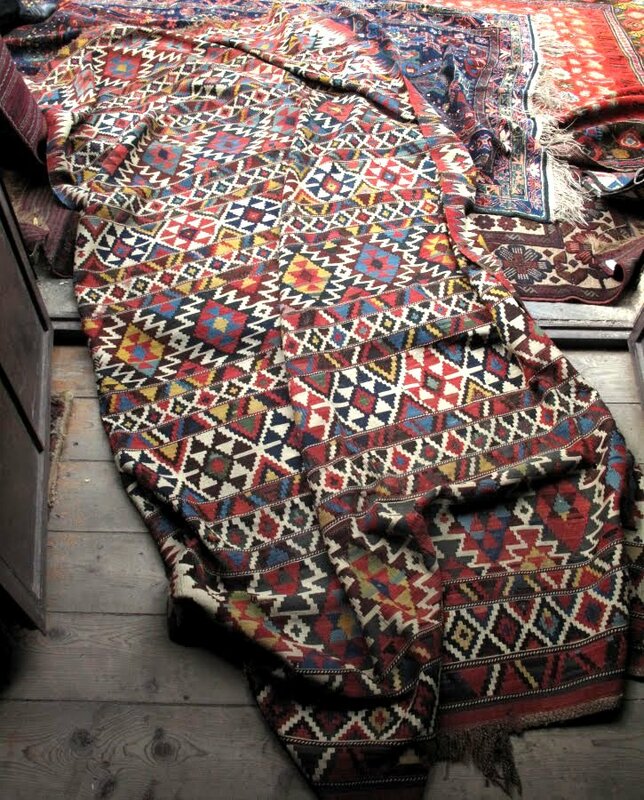 If the carpet bug has sunk its teeth into you, this is a place worth returning to as regularly as possible! 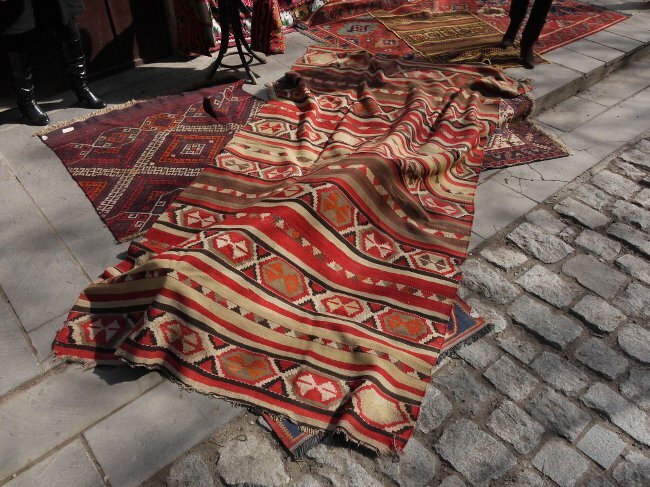 You never know. 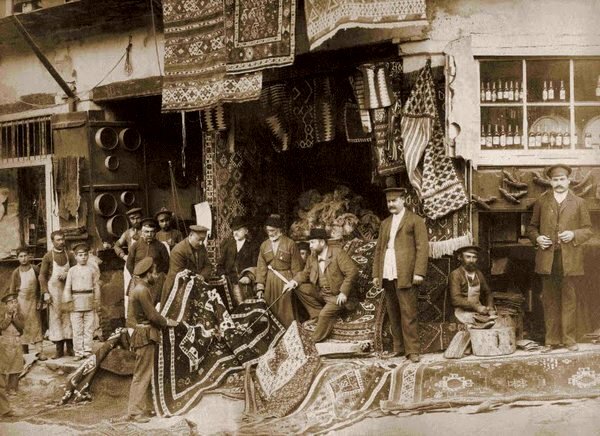 The shop assistants also make excellent Turkish coffee, and it would be worth the while of any carpet-lover to go and see what they have to offer. 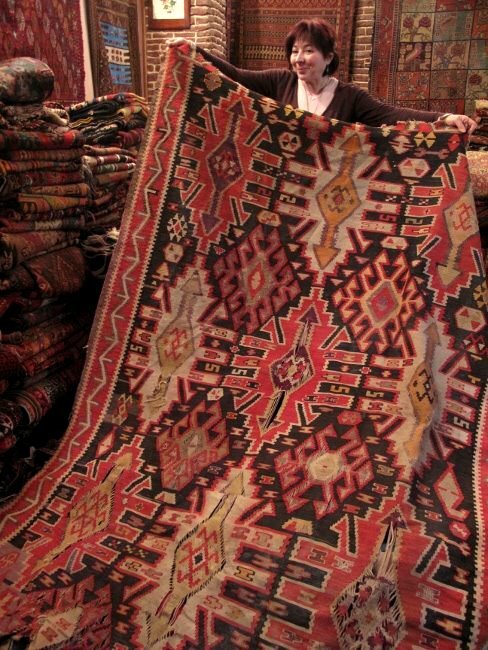 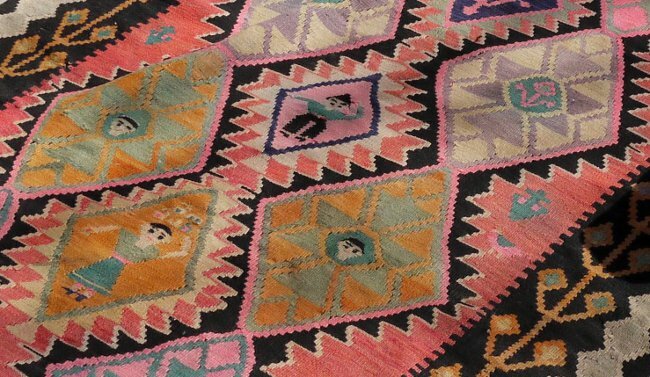 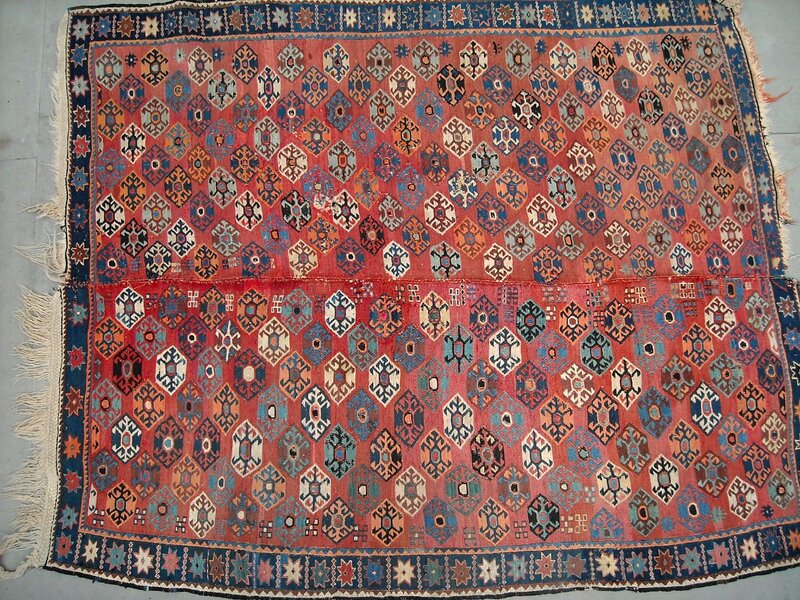 Manana Arkania shows off a magnificent kilim from Daghestan. 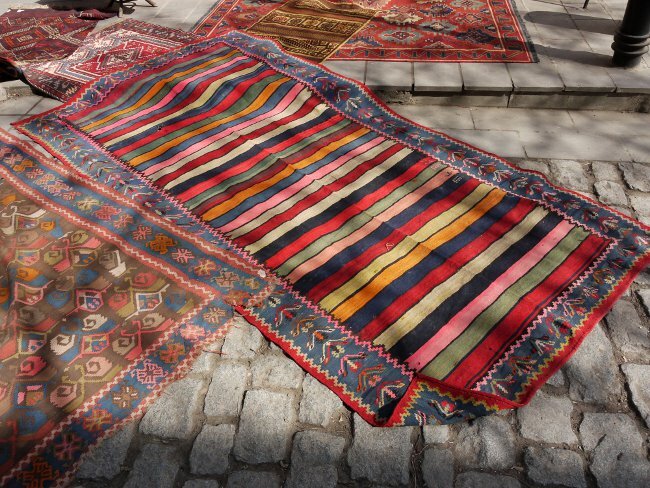 Her shop is at the lower end of Erekle II St (see map) and is open pretty much every day of the year. 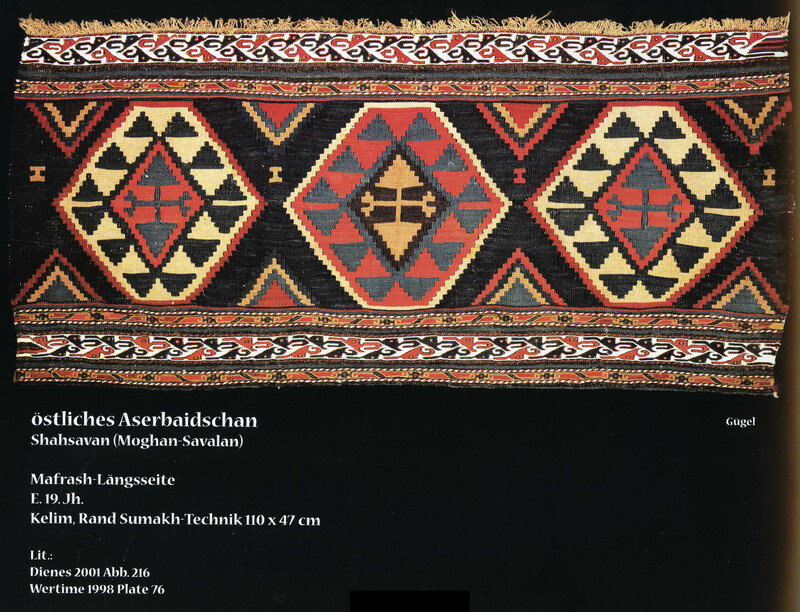 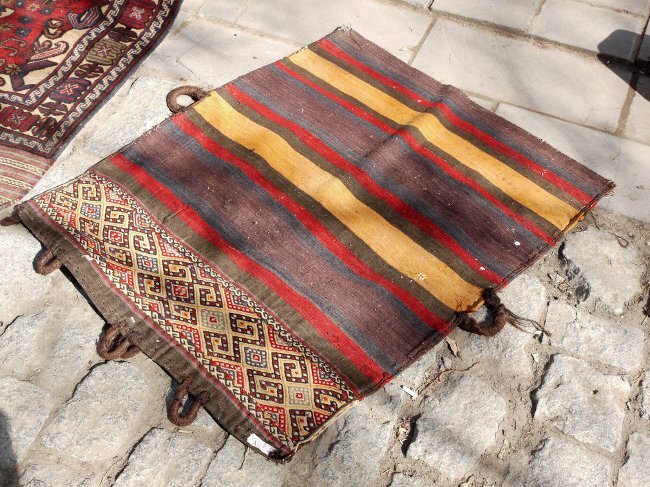 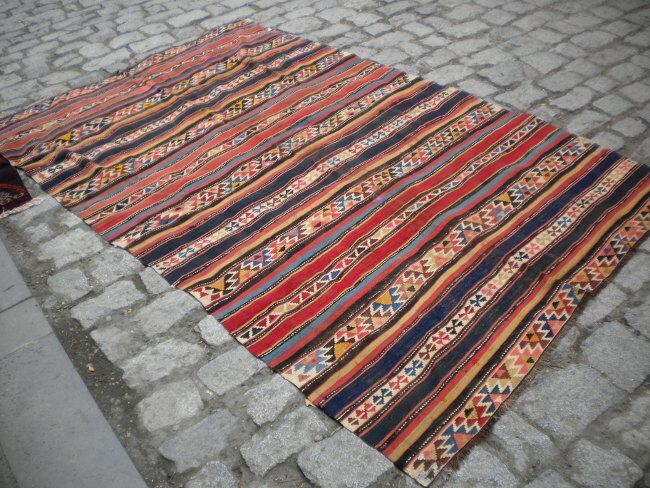 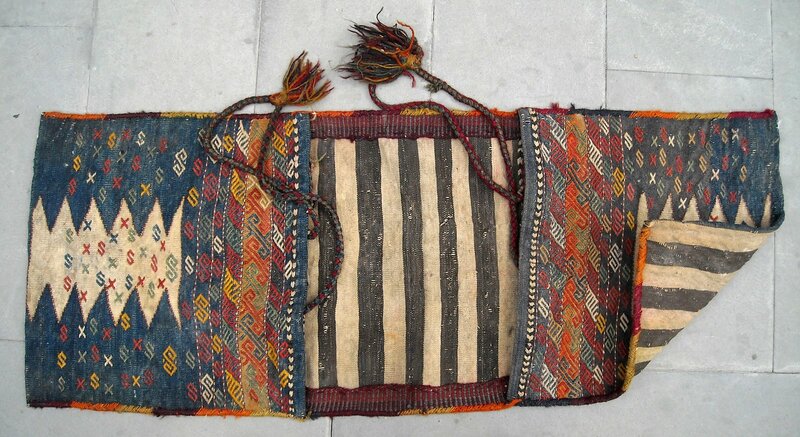 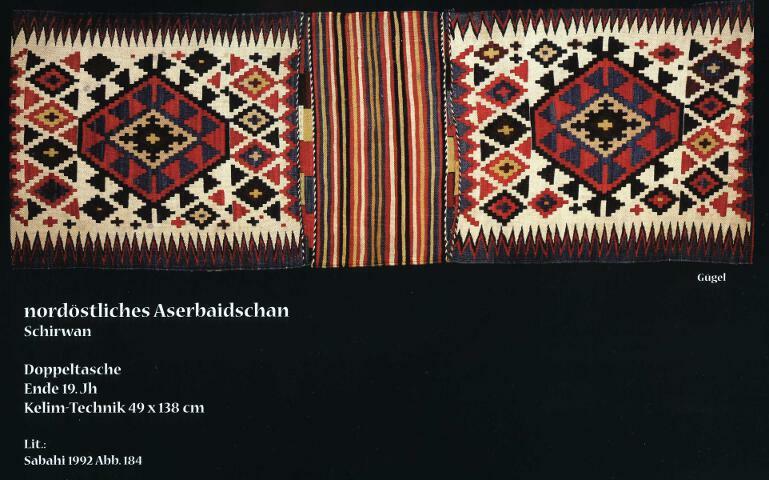 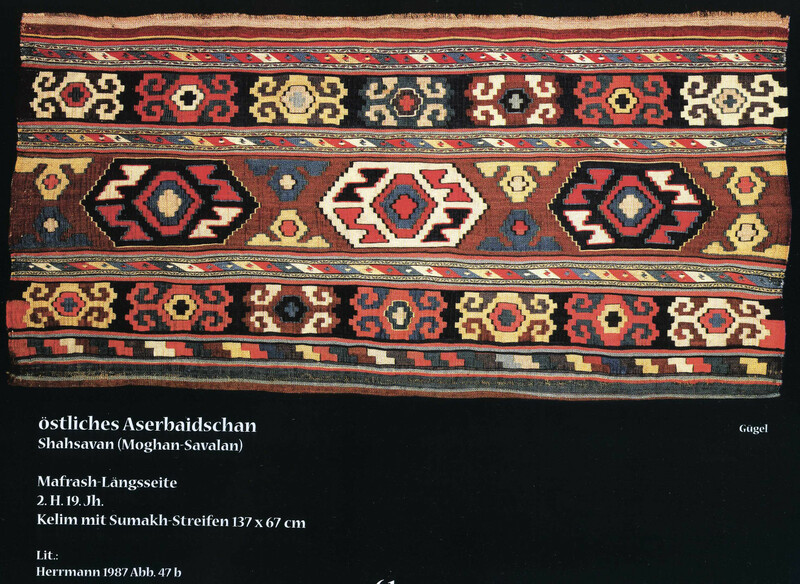 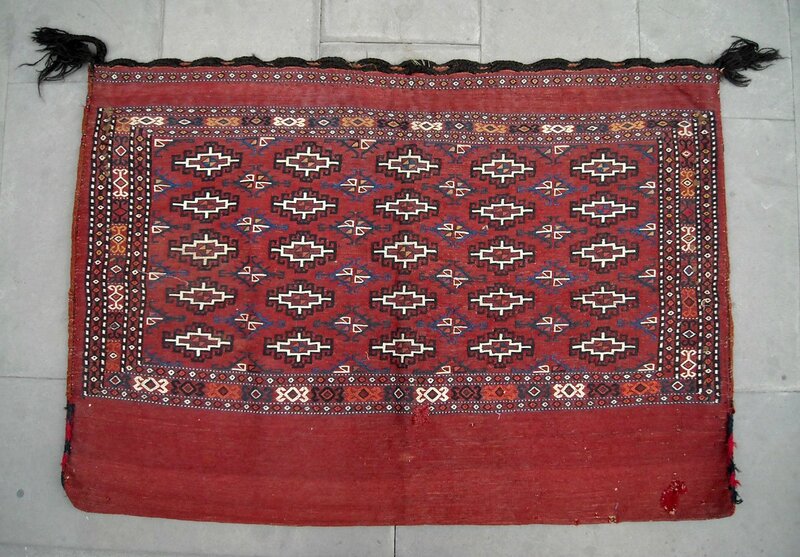 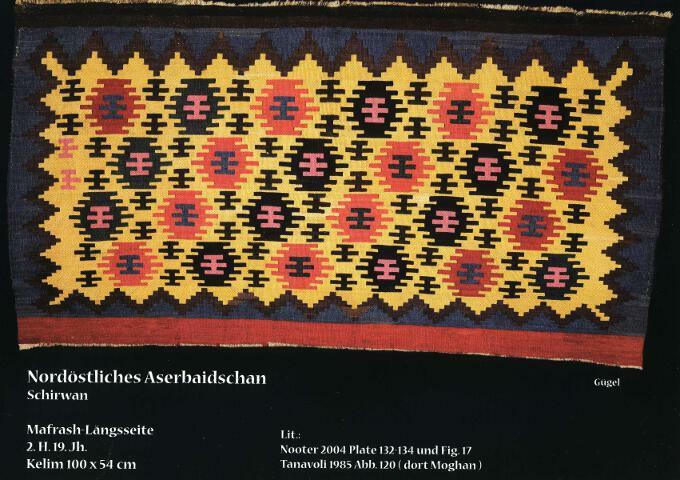 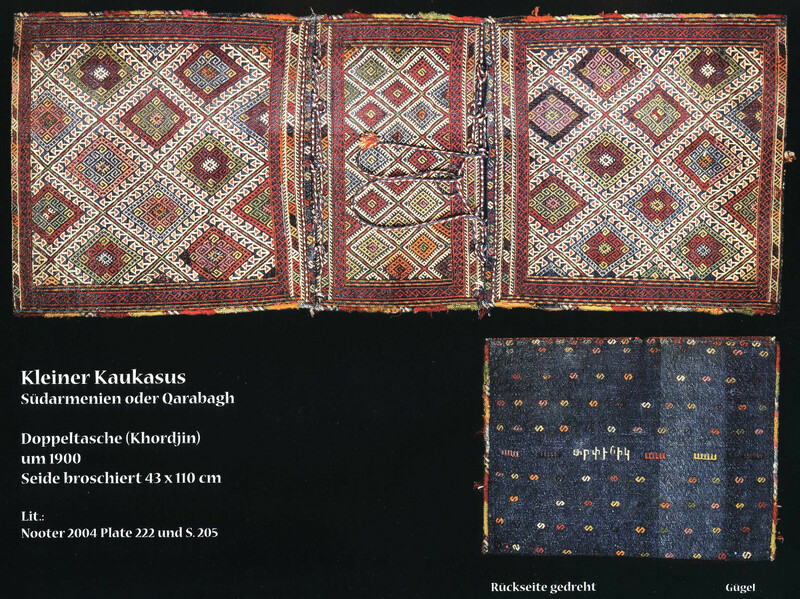 Some more pictures of kilims, carpets, saddlebags, &c.
An Azerbaijani chul (akin to a saddle-cloth) from Karabagh. 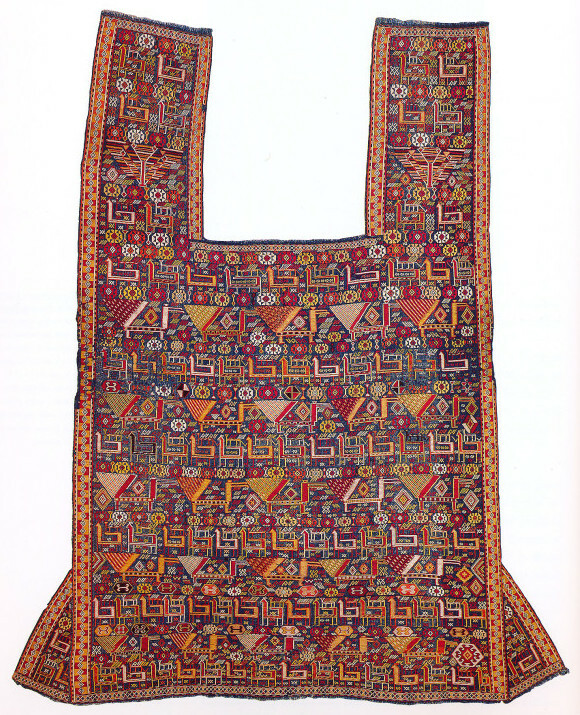 A stunning Kumyk, Dargin or Avar dum from Daghestan. 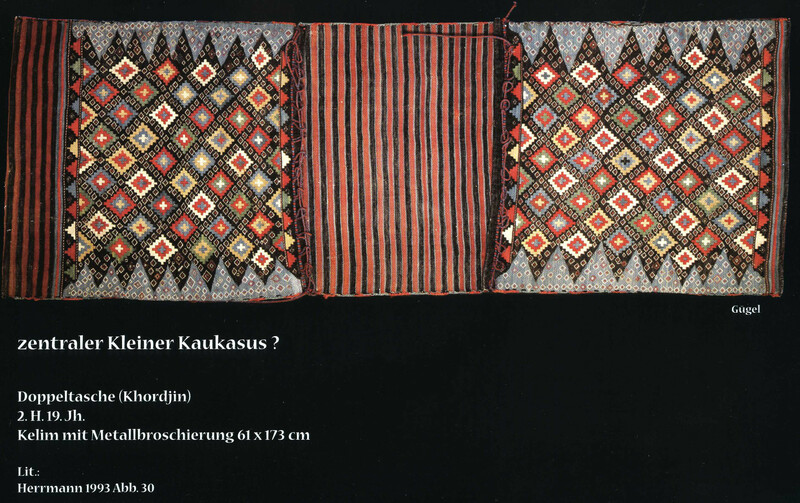 A selection of weaving and embroidery from the All-Russian Kustar (cottage industry) Exhibition of 1913. 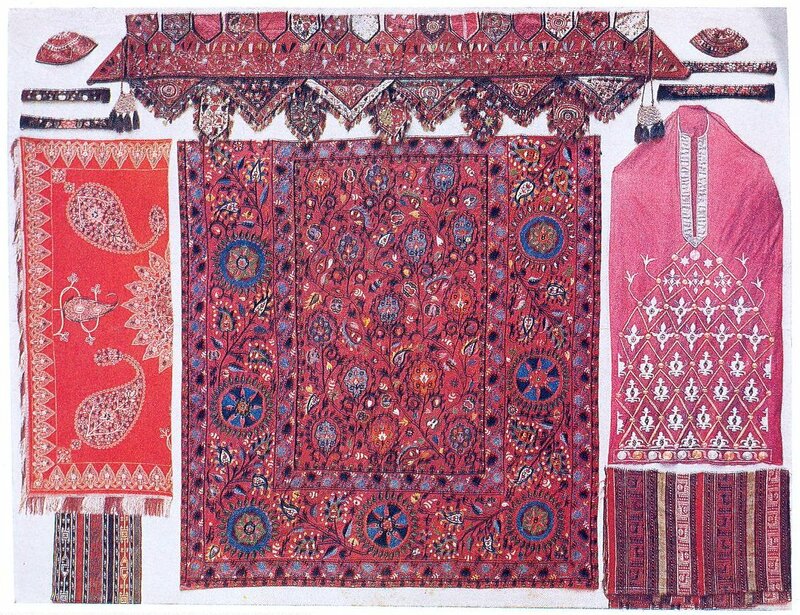 Top row: Left: Caps from Yerevan; Centre: "Old lambrequin from Shusha"; Right: Head-bands from Georgia. 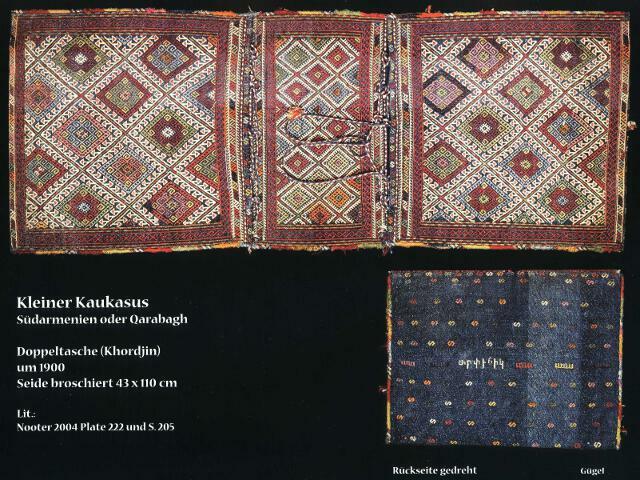 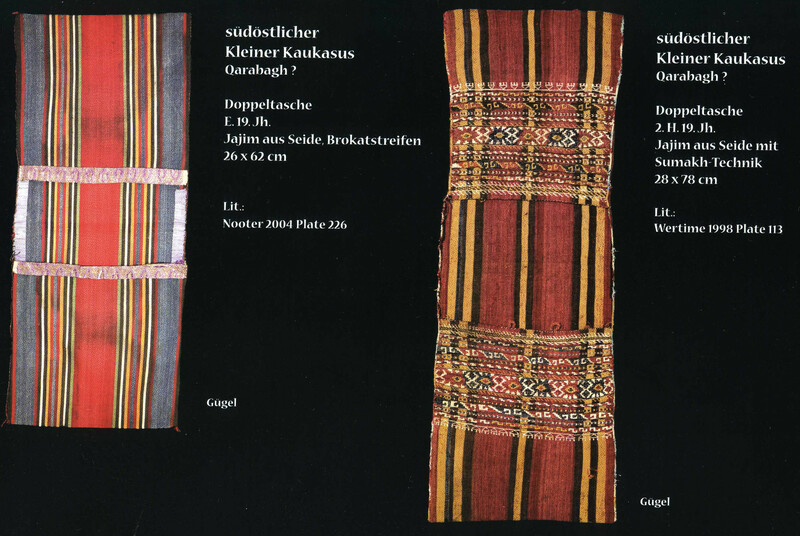 Centre row: Left and centre: Tablecloths from Shusha; Right: Shirt from Daghestan. 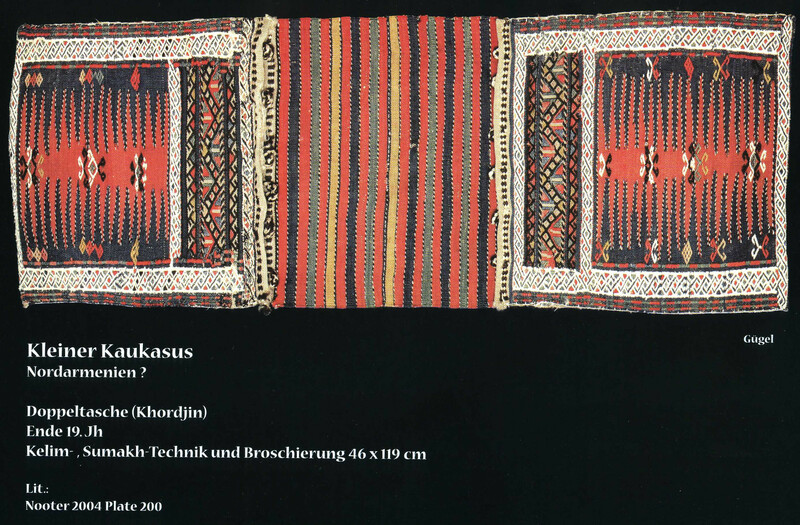 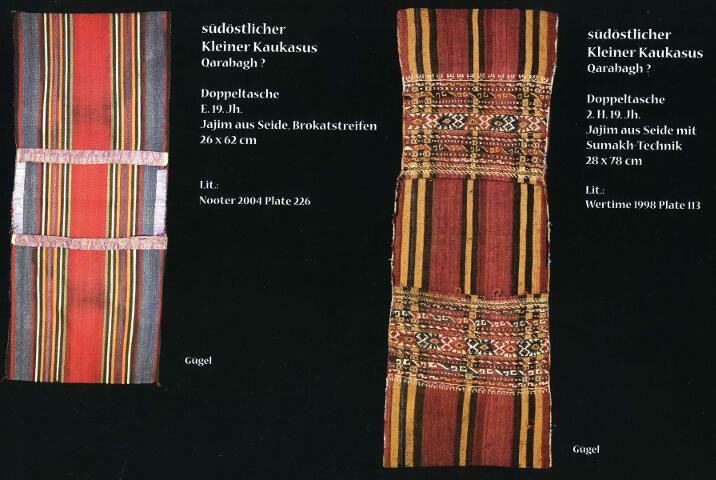 Bottom row: Left: Fragment of a silk jejim from Sheki; Right: idem from Shemakha.